The UN Commission of Inquiry (COI) released its highly-critical report last February, of which, the findings and recommendations were strongly endorsed by UN Member States at the March UN Human Right Council meeting. In May, and then further in September and October, the DPRK responded to the COI with: 1) a report by the DPRK Association for Human Rights Studies; 2) a dramatically revised approach to a UN human rights mechanism know as the Universal Period Review (UPR); and 3) a diplomatic counter-offensive at the current UN General Assembly (GA). 38 North evaluates these three COI-provoked North Korean responses to international criticism of its human policy and practices. In mid-September, North Korea released an official report presenting its defense of the situation of human rights in the DPRK—a disappointing 75-page screed stringing together almost every Workers’ Party of Korea (WPK) trope and cliché known to readers of KCNA, North Korea’s official news agency. Readers of the Study Association report will learn that Pyongyang was the center of the first ancient state in East Asia, opening up a ‘new era of civilization’; that Kim Il Sung liberated Korea from the Japanese occupation; that the US started the Korean War but in a ‘world-startling feat’ the Korean people won it; that the imperialist colony of ‘south Korea’ is still under US occupation; that there are separated families on the Korean peninsula because North Koreans fled to the south out of fear of a US nuclear attack on the DPRK, and so on. The Report identifies the UN COI as a marionette of the US and its satellite forces, and claims that this fabricated report is based on the testimonies of ‘human scum’ and ‘terrorist’ ‘riffraff’ who have betrayed their homeland, where people enjoy a genuine life and happiness. The passages above are taken verbatim from the Studies Association report. Readers interested in North Korea’s constitutional provisions, institutions and laws, or human rights policies and practice without the heavy overlay of WPK jargon are referred to the most recent DPRK report to the January 2014 Universal Periodic Review. One might have thought that the North’s diplomats would be embarrassed by the crudeness of the Studies Association report. But no, on October 7, the Permanent Mission of DPRK to the UN formally presented and distributed the report to all invited UN Member State Missions as well as UN-accredited journalists and NGOs, as part of the diplomatic counter-offensive described below. The Universal Periodic Review (UPR) is a recent addition to the UN human rights system. Over a repeated four-year cycle each and every UN Member State presents a written and oral report to the Human Rights Council describing the situation of human rights in that country. During the oral report, a delegation of officials outlines the country’s approach to human rights. Following this presentation, on the basis of the written and oral reports, other Member and Observor States publicly recommend to the reporting government suggested measures that could be taken to improve human rights practice. The next steps in this process are the crucial measures. The visiting officials take the recommendations from their fellow governments back to their home government for further consideration. Then, at the next session of the Human Rights Council, the representatives of the previously reviewed nation-state announces which of the recommendations his or her government has accepted and agreed too. In December 2009, a delegation from Pyongyang presented its first UPR report to the Human Rights Council. The Member States then made some 167 recommendations to the DPRK. But at the following session, in early 2010, during the second part of the UPR for North Korea, the DPRK Permanent Representative, pointedly under questioning, refused to accept any of the proffered recommendations for improving human rights previously made by other governments. The DPRK was the only UN Member State during the first cycle of the UPR to refuse to accept any recommendations for improving human rights, an omission duly and critically noted in subsequent UN resolutions on human rights in the DPRK. The current UN Special Rapporteur on Human Rights in the DPRK, Marzuki Darusman, a former Attorney General of Indonesia and a member of the COI, immediately welcomed the DPRK’s dramatically new approach to the UPR, encouraging all concerned parties, including the UN human rights system and civil society, “to seize the opportunities for engagement that the latest developments in the [UPR] have created,” particularly regarding cooperation with UN human rights mechanisms; violence against women and the rights of vulnerable groups; structural reforms regarding the rights to food, health and education; and family reunions. In contradistinction to the propaganda-satiated Studies Association report reviewed above, the DPRK’s response to the second-cycle UPR recommendations is a serious, considered and professional self-portrait of the DPRK’s human rights situation. Only the briefest samples of the 263 official responses can be provided herein. Rejected out-of-hand as slanderous were suggestions to abolish generic crimes such as “activities against the State or society,” allowing independent monitors to visit the country, abolishing the death penalty and public executions, allowing abductees and descendents to return to country of origin, closing prison camps, and any references to previous recommendations by the COI or Special Rapporteur. Recommendations rejected after consideration include: allowing observers access to detention facilities, eliminating sanctions against persons who left the country without authorization, ending restrictions on freedom of expression, allowing independent newspapers and media, or legalizing food and other markets. The 58 “noted” recommendations included ratification of additional human rights treaties and protocols, establishing a national human rights commission, joining the ILO, taking measures to improve humane treatment of prisoners, a moratorium on the death penalty and public executions, ending forced labor, and reforming legislation regarding freedom of religion and belief. “Partially accepted” recommendations include aligning its criminal justice system with international standards, ratifying additional named human rights treaties, and submitting treaty implementation reports to the UN in a more timely fashion. Among the 113 “accepted” recommendations are ratifying treaties that have been previously signed, further strengthening the domestic legal framework, intensifying efforts to increase the well-being of the population, additional measures to improve the rights of women and children, stepped-up efforts at human rights education, training and awareness, empowering women in decision-making, and increasing access to food, health services and housing. The third leg of the DPRK response to the COI report is a series of high level diplomatic initiatives. Kang Sok Ju, a very high level former nuclear negotiator, was sent off to the EU with offers of renewed dialogue. Foreign Minister Ri Su Yong visited the General Assembly, marking the first time a DPRK Foreign Minister has attended the GA in 15 years. The DPRK Permanent Representative to the UN even hosted a meeting to describe and distribute the Human Rights Studies Association report noted above. Most importantly, on October 6, the DPRK Permanent Representative Ja Song Nam wrote a letter to all other Permanent Missions to the UN in NY informing his fellow ambassadors that the DPRK would be submitting its own draft General Assembly (GA) resolution on the situation of human rights in the DPRK, along with an annex outlining the main elements in the forthcoming DPRK draft resolution. This will be, in effect, a counter-resolution to the GA resolution on DPRK human rights (since 2005) primarily authored by the EU and Japan. Normally resolutions at the GA in November and December follow closely the text of resolutions at the Human Rights Council the previous March. 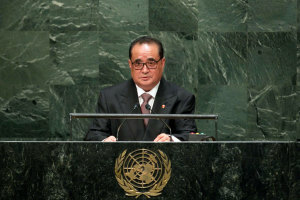 The Council resolution in March 2014 endorsed the COI findings and recommendations, “condemning in the strongest possible terms” North Korea’s crimes against humanity, and recommending, by a huge vote margin, that the General Assembly request the Security Council to consider referring the DPRK to the “appropriate international criminal justice mechanism”—a diplomatic euphemism for the International Criminal Court (ICC). It is entirely likely that the EU-Japan resolution at this year’s General Assembly will contain such a provision. Strong GA support will be necessary to persuade Security Council members to undertake this consideration, given the possibility of a Chinese and/or Russian veto. At the last GA vote on the DPRK human rights resolution, the vote was 112 YES, 16 NO, with 55 ABSTENTIONS. Even those governments that voted against the resolution had nary a kind word to say about North Korea’s human rights record. It will be interesting to see what collection of Member States will sign on as co-sponsors of the DPRK’s forthcoming resolution. Quite possibly, the DPRK’s resolution, if it is not withdrawn at the last minute, is intended to hold down the number of supporting States or hold up the number of abstaining Member States on the EU-Japan resolution, most of whom are quite geographically far removed from events on the Korean peninsula, and who may not want to get involved on either side of dueling resolutions on North Korea’s human rights situation. The UN Special Rapporteur Darusman will present his most recent report to the Third Committee of the GA on October 22. The Third Committee will vote in late November, and the formal GA vote will take place in mid-December. For it to work, the UN human rights system assumes that indigenous civil society groups, domestic and foreign journalists, governmental, inter-governmental and non-governmental monitors will be able to corroborate on-the-ground claims that a government is observing and respecting the rights of its citizenry. However, none of these conditions apply to North Korea. In this type of situation, if the regime in question does not allow on-site, on-the-ground monitoring, then the refugee/victim testimonies, not the unverifiable statements of the government, stand. With more than 25,000 North Korean defectors in South Korea and hundreds more around the world, there is ample information about the types of abuses have taken place inside North Korea—and the overwhelming narrative is quite the opposite of what the DPRK government purports. In practice, many non-governmental human rights organizations (NGOs) submit “shadow reports” that highlight human rights violations and problems that are not mentioned in the previously submitted written report by the various governments. Many of these “shadow reports” from NGOs that have “consultative status” with the UN Economic and Social Council (ECOSOC), are circulated at the Human Rights Council. But only Member and Observor States make recommendations at the UPR. At this presentation, the DPRK spokesperson announced that “political prisoners” was not in the DPRK’s vocabulary and the so-called political prisoner camps did not exist. “Permanent Representative” is the title of a Member State’s top ranking ambassador to the UN. “Position of the DPRK on the recommendations received during its first cycle UPR.” As it was submitted way past the deadline, this publication received no UN Doc. Number or designation, but it is available on the UN website, www.ohchr.org/EN/HRBodies/UPR/Pages/KPSession19.aspx. “Report of the Special Rapporteur on the situation of human rights in the D.P.R.K.,” Marzuki Darusman, UN doc. No. A/HRC/26/43, 13 June 2014. Paras 25-35, pp 9-12. “Report of the Working Group on the Universal Periodic Review: Democratic Peoples Republic of Korea – Addendum: Views on conclusions and/or recommendations, voluntary commitments and replies presented by the State under review”, UN doc A/HRC/27/10Add.1, 12 September 2014. See “38 North UPR Working Group DPRK Response,” for a full breakdown of these recommendation categories. Ri’s full remarks can be accessed at http://www.un.org/en/ga/69/meetings/gadebate/pdf/KP_en.pdf. One of several “committee of the whole” committees within the GA that deals with social, economic and humanitarian issues. Special Rapporteur’s Report of 13 June 2014, paras 36-38, pp. 12-13. Ibid, para 10, page 5. Ibid, para. 19, page 7.